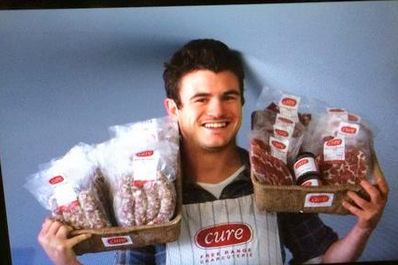 Cure Deli offers streaky (from the belly), back (the loin), and lean leg bacon. Unusually, Raubenheimer also dry-cures and cold-smokes an ultra-lean neck bacon. It’s tender, salty-smoky and marbled like a jigsaw puzzle. But it’s the sausages that will rock your world, especially if bland, processed commercial pork-offcut versions tasting of sawdust are your starting point. Cure Deli’s pasture-reared breakfast sausages combine coriander seed hints (they include honey) with nutty depth. Toulouse sausages balance raw garlic with black and white pepper, and nutmeg. Fresh chorizo is the fieriest, pairing smoked paprika, cayenne pepper and garlic. But my favourite is the bacon sausages partnering apples or pears, bursting with smoky bacon offcuts, savoury elements and hits of fruit sweetness. Naturally there are no rusk fillers, breadcrumbs or preservatives. Raubenheimer makes sausages every week from cleaned, gutted whole pigs. His bacon goes into a dry cure for about a week, followed by hanging and cold smoking. CURE DELI Tel 072 240 8511, website. Products available on Saturday mornings from Oranjezicht City Farm Market Day and Earth Fair Food Market, Tokai. This article appeared in The Times on 13 August 2014.